This Post has already been read 1212 times. Punjab Information Technology Board (PITB) is going to provide free Oracle Certification Training. 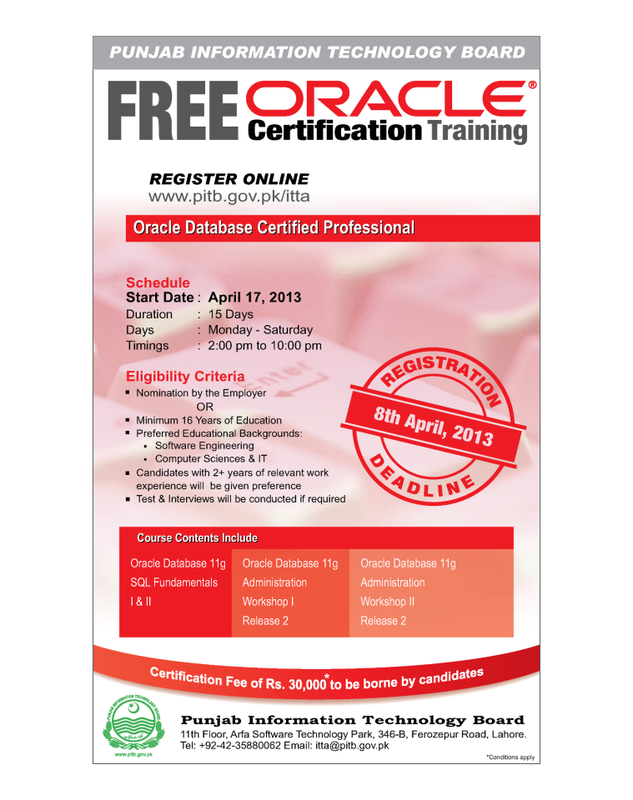 The Oracle Certified Professional Training would be start from April 17, 2013 and will be included on 15 days. Each above mentioned modules has a separate exam. Note: The degree of the candidate should be from an HEC recognized or a well reputed foreign institute. All dues to be paid in cash through online banking at any branch of the Bank of Punjab. Branch Name: Bank Of Punjab, Edgerton Road Branch, Lahore. * This is the deadline for registering online as well as the payment of the registration fee.